BLAST ROOMS - ICM Inc.
A Blast Room allows the operator to enter the work chamber and directly blast parts that might be too heavy for, or not fit in, a Blast Cabinet. In the most basic Blast Room, the operator sweeps up used abrasive and shovels it into the pressure pot. 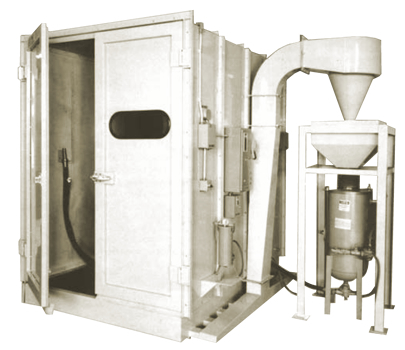 In a Blast Room with Air Swept Duct(s), the operator manually sweeps abrasive into a duct thus eliminating the shoveling process. 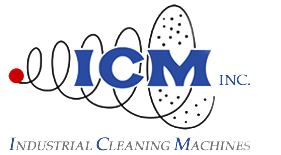 Advanced Blast Rooms, equipped with an ICM Air Swept Floor, eliminate both the sweep and shovel process resulting in continuous production. The operator manually sweeps and then shovels blast media from the floor back into the Pressure Pot. While the operator blasts parts at full production capacity, reusable abrasive media and blast debris falls into the ICM Air Swept Floor and is continuously carried by high velocity air to a cyclone reclaimer where the good abrasive is recycled, and debris is exhausted to the dust collector. Abrasive is manually swept into Air Swept Duct(s), which carry the abrasive media and blast debris to a cyclone reclaimer where good abrasive is separated and returned to the pressure pot, and debris is exhausted to the dust collector.